Good coffee has arrived on the International Space Station (ISS). An Italian designed espresso machine designed to fill a pouch with espresso will be installed on the ISS. 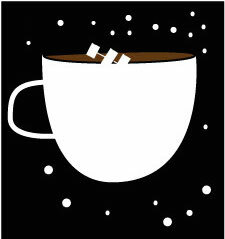 They do have coffee in space currently, but it is apparently the instant stuff that tastes terrible, but works. I’m by no means a coffee snob and I’ll drink it in a pinch, but a decent cup of coffee is something I would miss. I know millions around the world agree with me. It is a fascinating intersection of culture, science, engineering, and a plant. The coffee company Lavazza and Space agency food supplier Agrotec designed the experimental ISSpresso machine. A microwave-sized inanimate contribution to human space exploration. 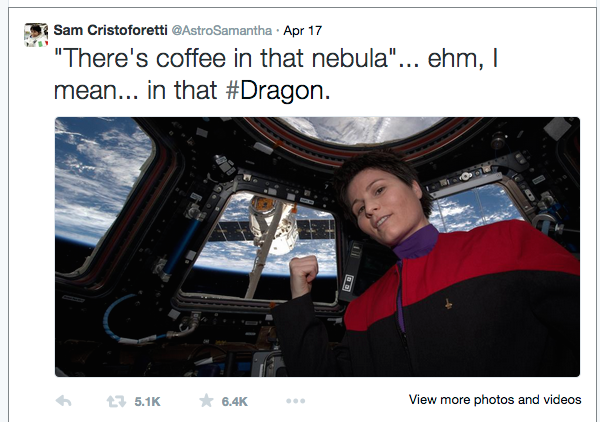 Italian Astronaut Samantha Cristoforetti is the person that will presumably get the first cup of coffee made with the espresso machine. This project was apparently inspired by a previous Italian astronaut that said the thing he missed most when he was aboard the ISS was espresso. It is a fascinating intersection of culture, science, engineering, and a plant. “All Hail the Great Coffeebean, long may we be bathed in it’s caffeinated waters! I am still convinced that Coffee tells more about the nature of humans than anything else. 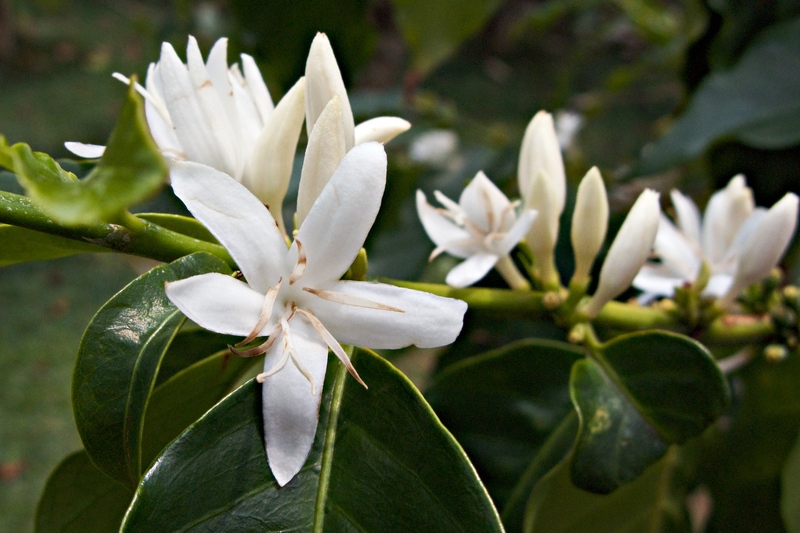 Coffee flowers. Source: Time Wilson, via Flickr. License: CC2.0. The story of better coffee for the hard working astronauts on the ISS has gotten a lot of coverage. This post on Gizmodo is a good one. The detail at the end about specially designed cups to allow drinking in microgravity further drives home the idea of trying to simulate on-planet experiences in space. Many scientists run on coffee, so perhaps this espresso machine will increase productivity. Or perhaps just provide a psychological boost, which are also important. Space is not where humans are designed to live. It’s amazing that we can sustain a small group of people in a series of modules about the size of an NFL football field. It is an alien environment where we get some amazing pictures of Italy, for example. It is a new perspective on our planet and in some ways a better experience of nature than any of us down hear on Earth will ever have. However, the natural beauty of the Earth is seen, not touched. Not that that diminishes the rare experience of being an astronaut. 7,000,000,000 (7 billion) of us live on Earth now. 6 reside on the ISS. If we’re going to to further than low-Earth orbit, how much of home can we take with us? Good coffee may just be the beginning. Having actual plant life around may be critical. and not just plants designated for experiments in microgravity, but to keep some semblance of exposure to the natural world, to Earth, to the familiar. Wired has this story about creating cheese without the cow. Perhaps milk can be produced a similar way and mixed with the quality coffee made on the ISS; one step closer to normality, perhaps making it that much easier for a human to live absent the entire world. Does it matter if it doesn’t come from the animal anymore? Or the plant? The extreme version of this is replicator technology in the Star Trek universe. Food and drink materialize out of seemingly thin air. Many of us here on Earth aren’t fully aware of where the products we consume come from, so will it matter the source when we’re exploring the solar system? Many of us here on Earth aren’t fully aware of where the products we consume come from, so will it matter the source when we’re exploring the solar system? This NPR story noted a concern about this coffee: that there is increased garbage in the form of the coffee capsule needed to product the espresso. It’s like the much maligned Green Mountain Coffee made K-cup in space. In space travel, mass is nearly everything; it costs a lot to bring pounds (or kgs) of stuff back and forth from low Earth Orbit, or beyond. And storage space for coffee capsules is not unlimited on the ISS (or for the totality of garbage produced). One nice thing about the ISSpresso machine is that it is more flexible than just coffee. It can brew tea and soup too (again like K-cup systems). The design and engineering took some doing it sounds like. It cannot leak. No steam can be emitted from the heated water for fear of harming sensitive (& life preserving) equipment on the ISS. Whether it works as predicted has yet to be seen. But it is a fascinating engineering challenge to have taken on. And now for some pure hand waving. The ISSpresso may lead to more applications in space travel, particularly with dealing with flowing water under pressure and without leaks. Perhaps irrigating plants using a water reservoir. Use the station’s water supply for an ISS farming module. Perhaps the Monsanto Maize Module (MMM…), testing agriculture in microgravity on a small farm scale. This may not be as far-fetched as it sounds as NASA and technology firms have a long history of partnering to make space exploration possible (every dollar spent on an off-Earth mission is spent on Earth). And Monsanto is a (bio)technology company. Coffee is far from the only plant based product on the ISS, I’m sure. Most of the food they eat is, no doubt (except astronaut ice cream…they sell it to the public because the astronauts won’t eat it according to astronaut Mike Massimino). But coffee occupies a particularly prominent place in the world. It’s one of the most traded commodities after oil. And like some other crops, it’s under threat from a fungus called coffee rust, possibly exacerbated by climate change. 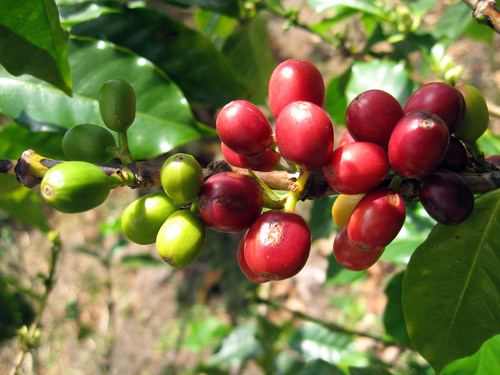 Coffee is part of a grand challenge the world has: growing crops on land with less resource input, better genetics, and lowering footprint human activity has on the natural world. Even if 6 people are on the ISS, Earth is our home for the foreseeable future. Taking care of it matters. Beyond coffee, what other biodiversity may prove useful as we keep taking steps to explore the solar system? I wrote before that the living world is a library of genetics, a legacy, that we take advantage of all the time. And a lot of which we just aren’t even aware of currently. The ISSpresso story really evokes the connection of Earth and space. We need to sustain here to sustain there. 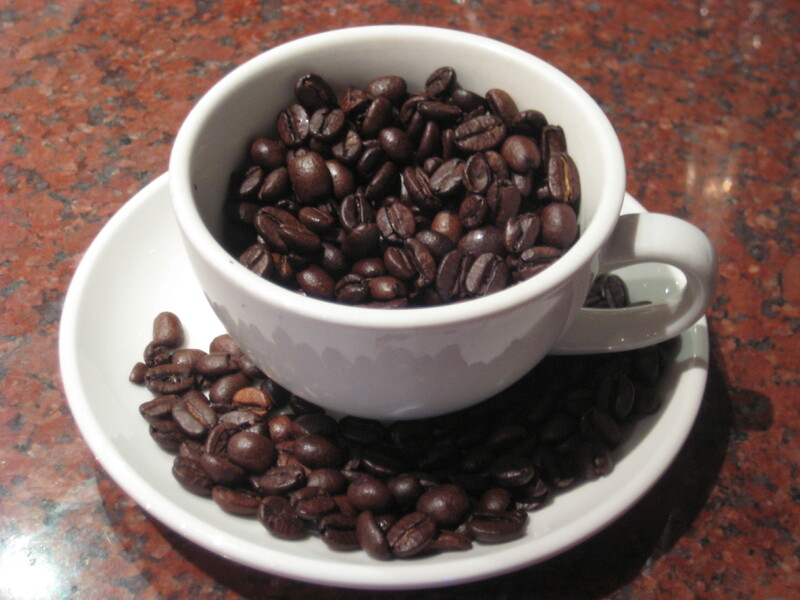 Coffee is beloved in cultures and places like Italy where it does not grow natively. This plant really has taken over the world and now in this improved form, it is up in space. Coffeespeed, ISSpresso. Coffee comes to the ISS…or is the ISS getting added to the Earth’s Coffee? Small surprises and a new feedback loop. A Naturally Genetically Modified Organism.